Mouth-watering dishes with authentic flavor which will transport you to the heart of Malaysia. One-of-a-kind-of-drink. We have VQA wine, craft beer, special cocktails & martinis. Renovated location with new design! More authentic! Getting tried of traditional egg Benedict? Menu may vary by different locations. located in downtown vancouver - 1779 robson st. 2nd floor. It offers a semi-private area which is an ideal setting for a range of private events including cocktail receptions, gala dinners, birthdays, anniversaries, business lunches and board meetings. For more information, please contact 604-569-3363.
located in kitsilano area - 3005 w. broadway. It can accommodate up to 28 people which offers a more intimate and relaxed space for private dining. Ideal location for family/friends gathering with our warm and welcoming setting. For more information, please contact us at 604-734-3005. A reservation must be confirmed with a valid credit card. Any cancellation must be made prior to 24 hours of reservation to avoid a $50 charge per reservation. Please noted that your credit card won't be charged before you dine with us unless you either don't show up or cancel within 24 hours before your reservation. One of the interesting part of Malaysian Cuisine is joy of sharing. At Banana Leaf, you have lots of choices from appetizers to desserts. Therefore, we suggest you to invite your friends and family members to dine not just for food, but also for the experience. Mango Kerabu - Shredded fruit salad with cucumber, carrot, and jicama. Tossed in kerabu fish sauce and our sweet and sour dressing. Served with crushed peanut, sesame seed, and shallot. 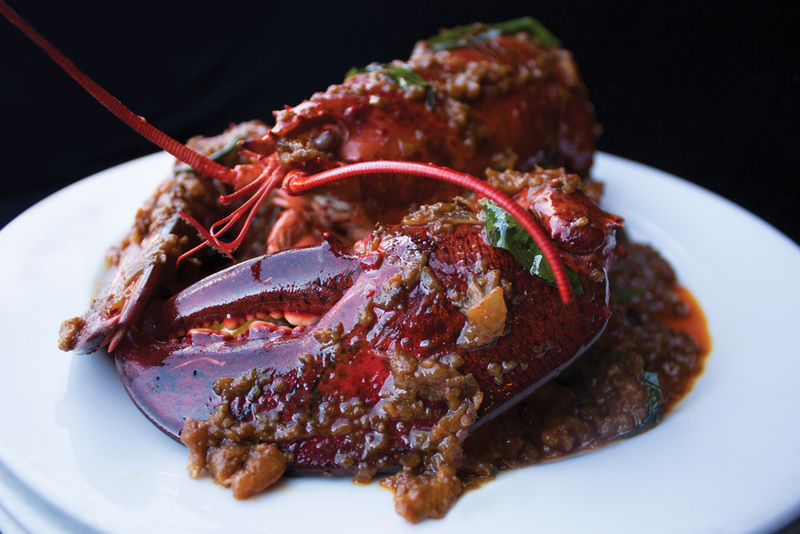 Kum Heong Lobster - The entire lobster, shell and all, breaded and wok-fried in Malay and Chinese spices and dried shrimp, curry spices, oyster sauce, chili and lemongrass. Caramelized Ginger Black Cod - Breaded bone-in black cod steak topped with Malay black sweet sauce, enriched with caramelized ginger, garlic, shallot, and Chinese wine.